Gov. Janet T. Mills raises her hand in victory in Augusta on Wednesday night. Good morning from Augusta, where Gov. Janet Mills later today plans to authorize the release of $15 million in senior housing bonds approved by voters in 2015 but blocked by her predecessor, who isn’t happy with many of her changes so far. The process to enact blocked Democratic initiatives and reshape policy-making is moving forward. The order will allow the immediate use of $500,000 to help fund 200 new affordable housing units and the weatherization of 100 homes for low-income seniors across Maine. The rest will be earmarked for projects this summer and matched by $22.5 million in federal funds. Issuing the housing bond is one of the easiest reversals of former Gov. 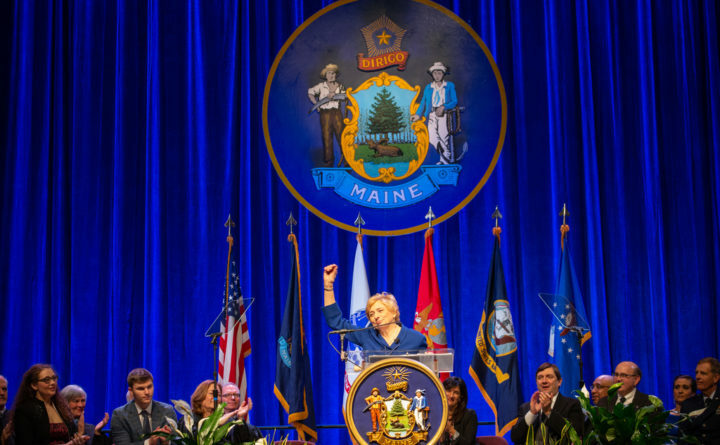 Paul LePage that Mills can make early in her tenure. It was supported by more than 69 percent of voters in 2015, but the former Republican governor opposed it and stalled it after winning veto override votes of legislative proposals to usurp his bonding authority. The bonds can be sold this spring. Mills on Monday officially posted her first 14 Cabinet nominees, triggering the legislative confirmation process. However, many of the Democratic governor’s nominees — including Jeanne Lambrew in the Department of Health and Human Services, the largest department — are serving now as acting commissioners in the agencies. Nominees will be interviewed within the next 30 days by joint legislative committees, who will pass their recommendations on to the Senate for a final vote. Though Mills has yet to name her choice for commissioner of the Department of Conservation, Agriculture, and Forestry, that’s to come this week. Cabinet members should expect to be in their posts without “acting” titles by early March. Mills and Lambrew have already reversed LePage by opening Medicaid expansion to more than 500 people last week, albeit without a way to pay for it over the long term. On Monday, the new governor announced that 180,000 Maine recipients of federal Supplemental Nutrition Assistance Program will receive their monthly benefits early to offset problems caused by the federal government shutdown. One of LePage’s last moves in office was to pardon a former Republican legislator of a drug conviction alongside an unknown group of about a dozen more pardons. Mills has said she wants to see transparency around pardons. LePage insisted the process was transparent and then doubled down on a long-standing threat to oppose her in 2022, saying he was “very close” to announcing that he’ll challenge her then. The House of Representatives will consider two rule changes, though the body doesn’t always follow its rules. The House and Senate are scheduled to convene at 10 a.m. today. They will mostly be sending bills to legislative committees. However, the House will consider two rule changes from Assistant House Majority Leader Ryan Fecteau, D-Biddeford. Fecteau wants to ban members from taking video or photos of themselves and other members while the House is in session. That would ban members from doing self-shot videos of floor speeches, as we’ve seen occasionally in recent years. The other change would match the House’s precedent by scrapping a rule barring the chamber from doing business after 9 p.m. that is often waived toward the end of pressure-packed sessions. If only they thought of reporters’ sleep schedules. Here’s your soundtrack. — A Maine county jail changed the time it releases inmates from midnight to 6:30 a.m. The change came after a former inmate criticized Penobscot County officials for allowing inmates to be released in the middle of the night when buses aren’t running and homeless shelters have closed. Instead of simply releasing inmates the minute their sentences expire, jail administrators in Maine try to balance inmates’ right to freedom with the availability of services and community needs. — A Maine biomass company targeted for assistance by a legislative bailout bill two years ago missed out on at least 80 percent of available subsidies. Former BDN data guru Darren Fishell reports that by the end of 2018, the company, Stored Solar, had generated enough power to qualify for up to $2.1 million in subsidies, out of a possible $9.4 million. — A Maine coastal town is considering a ban on fast food joints in its upscale downtown. Later this month, the Camden planning board will hold a public hearing on a zoning amendment that would “ensure that food service businesses in Camden respect the character of the community and do not create undue impacts in terms of noise, littler, traffic and other adverse impacts.” If the proposal wins approval from the planning board and the selectboard, it would go to a town meeting vote in June. Both of my Daily Brief colleagues celebrate birthdays this week. How should I mark the occasions? Because my birthday falls during summer vacation, I thought I would escape. But during the last week of school, she called each of the summer birthday students up to the front of the class so she could administer her special brand of birthday greeting. Years later, I had a summer job for a company with a workforce represented by the United Steelworkers union. After a one-week strike by the full-time workers, the part-timers like me returned as full-timers who had to join the union. My probationary period ended exactly on my birthday, which meant I got it off with pay — because the union had negotiated that benefit. What a gift! But that ain’t happenin’ here either.